I’m not sure why my grocery store bouquet had a name tag on it. The “Wow Bouquet” didn’t have much wow to it with the flowers a bit crushed and broken inside the cellophane, but it satisfied the urge to inject some colour into an otherwise snowy and grey day. If you’re like me and you have a hard time drawing people in motion, I strongly suggest you check out my friend Marc Taro Holmes’s new online video course “Sketching People in Motion” on Craftsy.com. I’ve started to watch the course and there’s no one who teaches this subject better than Marc does. If you email me or leave me a comment, I can send you a link that will get you a $15 discount for the course, which comes to about 50% off. Seems like a great deal to me. How great is this! Thank you Shari and please send me the link. Thanks Ethna. I emailed you the link. Thanks, Shari….but I haven’t received your email yet…….have checked the junk(!) and the trash to no avail….maybe it takes a while?? I think it worked now Ethna, right? Thanks Tony. The link has been sent. I think your wow bouquet is fabulous! I LOVE the effect you achieved with so few brush strokes. I am learning so much from your sketches. Thank you. Yes, I would like to try the people in motion course done by your friend. And 50% off is always music to my ears. Thanks Anne. Enjoy the class. I sent you the link. I always love your paintings and use of color. I would like the link to Marc Taro Holmes’ Craftsy class, also. Enjoy the class. I sent you the link. I wanted to take his course, and can always save the $$ as I’m a working stiff! Enjoy the class. You should have the link in your inbox. Enjoy the class Mary. I emailed you the link. I think you should ask that question to Marc. He’s very good about responding. That’s not a pansy, it’s only a carnation but I put a yellow centre on it. Wishing for spring! I’d like a go at his course, too. And I like that you have cropped the top of the flowers off, at least in this photo. It makes it much more interesting. I did crop a bit off the top Peggy. Made a more interesting composition. I have enrolled in Marc’s online class and I can tell you: it’s absolutely FANTASTIC. I’m so happpy to hear that! I’d love to have the link for Marc’s course discount, thank you! It’s snowing here again and going down to -20 by tomorrow so I’m painting some more geraniums in Paris this aft. PS love the bouquet name! Stay warm Tracey. I sent you the link. Yes ! I Would like to have the link to buy this course with Marc Holmes, with a discount. I sent it to you Louise. Enjoy! I have been enjoying your snow and winter paintings You really make them come alive. Thanks so much Ginny. I sent you the link. This is a WOW sketch. As always, your colour scheme is dynamic and intriguing and the composition well considered. Daring to crop the top of the bouquet! Great! I cropped off a bit of the top to make a better composition. Thanks Alison. Even the throwaways look good in your hands! Thanks for the info about Marc’s class. Enjoy the course Jerome. I sent you the link. Before I read the text of this post, I was thinking how great it would be to watch you paint this. It’s just lovely! I hope you consider making some videos some time. I would like to have the link for the discount on Mark’s class. Thank you! It would be great to do some videos Vicky. One of these days I hope to find the time. I sent you the link by email. Enjoy the class. I would be interested in the video discount coupon. I have just purchased his book and it seems to be about the best drawing guidance for all subjects from early sketches to accomplished work. As always, love your work. I look forward to each of your emails. I sent you the link Lynn. Enjoy it! This IS a Wow painting! Love it. I would also like the link to Marc’s video. Glad you like it Ashley. I sent you the link by email. Enjoy the class. That’s a good question Janice. Most of them are in a box in my basement. Occasionally I frame some of them and exhibit them with an artist’s group I belong to. Sometimes people ask if they can buy what I post and I sell them. I hope to soon have a new website to display them a little more prominently. I love the looseness of this and the background colors. I need to make a big sign to remind myself to keep washes varied with color. You do this so well. I,too, would love the link to Marc’s class! I’m going to do a post soon about a brush that I am using these days. It really helps to get the looseness and the varied washes. Enjoy Marc’s class. I sent you the link. 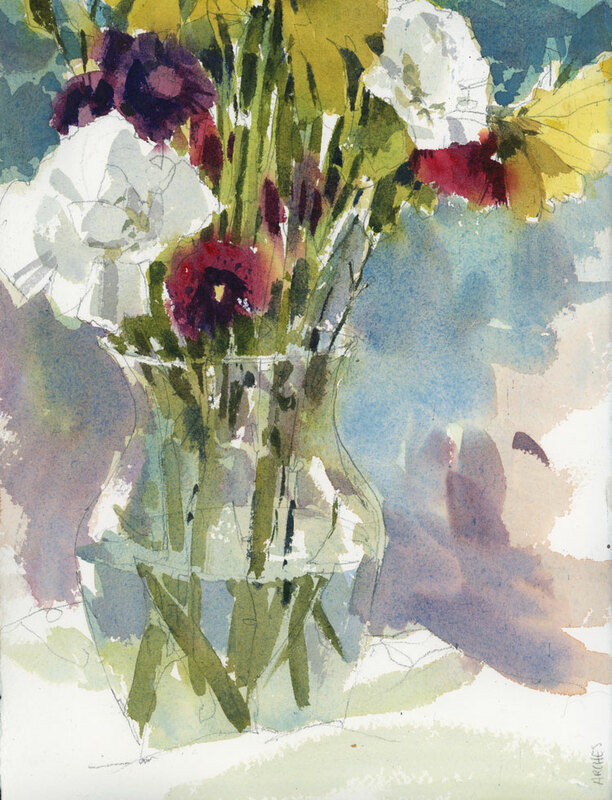 Lovely still life, Shari, and yes, please, I’d like the link to Marc’s video with discount. Thanks Jo. I sent you the link. Yup, this is a wow bouquet. I love this painting! Makes me want to go out and buy a wilted,,scraggly bouquet. There are plenty at my grocery store! Your work has been quite motivating for me. Such simplicity can be so lovely. Marc’s work also motivates me to do more urban sketching. Drawing people quickly is my weak spot so being able to take a class from him would be great. I would love the link. Thanks so much. I sent you the link via email. Thanks Mary. I sent you the link. Thanks so much! I’m already enjoying the class and his teaching! Thanks for offering the discount link, Shari. I continue to learn a lot from you on you blog. It was also great to have a class face-to-face with you in Seattle! It was great to be teaching in Seattle with that great group. I know you received the link I sent! Hi Shari, would you send me the link please? Thanks! It’s been sent Isabel. Hope you are well! Thanks Kathie! I sent you the link. I sent it again. Hope you received it. Would love the link to Marc’s course too please! Thank you for sharing. Would you consider doing your own Course? I love your style of watercolors! I sent you the link. I hope that one of these days I will be able to find the time to do some videos as well. I sent you the link Sue. I’m sure you’ll love the class. Thanks for the information, I would appreciate having the link for the 15 % discount. Love your blog the infornation id so clearly written, Just read your one on the use of certain colors and their usefulness in certain instances. Glad to hear that you like the blog Carroll. I sent you the link. Enjoy! I enjoy your blog and have learned a lot from your paintings. Please send the link – very generous of you. Thanks. I sent you the link. Enjoy the class! I would love to try Marc’s class. I sent the link to you. I hope you enjoy the class. I’ve been enjoying your blog for quite a while – and, of course, your watercolours. I’m enjoying Marc’s book and would like the ink for the discount price please. Glad you like the blog. Enjoy the class! I love your sketches and comments and have learned so much! Thank You! Please send me the discount link. Glad you like the sketches Desiree. I sent the link. I hope you enjoy the classes. I too would like the email link…. I sent the link your way Diane. Shari, I visit your blog everyday and love learning about your process. I am taking Liz Steel’s online class right now and think it’s wonderful. I’m doing so much more artwork as a result. Please send me a link to Marc’s class. These online classes are such a fantastic resource! I’m so glad to hear that you are enjoying Liz’s classes. I sent you the link for Marc’s as well. Hope you enjoy them! I would love a link! This class looks like so much fun. I sent you the link Kelly. Enjoy! I hope you enjoy the course Paula. I sent the link your way. I would love to try this class at Craftsy! I’ve wanted to learn to draw people better for quite a while. I sent you the link Marina. Hope you enjoy it. I’m confused on how to find the link. I can’t see it anywhere. Can u send it again? Love your blog! As I am next door in cold Vermont, I often go back to your southwest canyon sketches which capture the southwest so well! Please send the link for Marc Taro Holmes class. Thanks so much Dory. I often go back to my southwest photos when I miss the heat. I sent you the link for Marc’s class. Have fun! Love your sketches! Please send me the link to Marc’s class – I need help drawing people. Thanks. I sent the link. Good luck with the class. Thanks Katharine. Glad you enjoy the blog and hope you like Marc’s class. -Love your style, love your colours….I’ve learned so much. -Please send me the link to Marc’s course. Warm regards on a freezing, snowy day! Thanks so much Teresa. I sent you the link. Enjoy! I wanted to register for Marc’s class but my budget is a little low. This discount would be perfect. Will you please email it to me? Thanks! Also I would love to take a class/workshop from you too. Any plans to have one perhaps with craftsy? I love your watercolor style! Thanks Miriam. I just sent you the link. One of these days I hope to have the time to do some videos as well. I certainly have been asked many times.